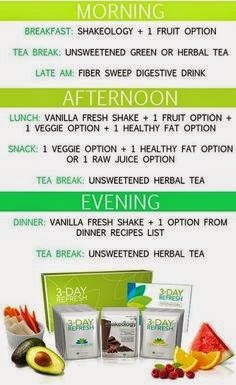 3 Day Refresh-EVERYTHING you need to know! I always feel SO accomplished when I do something like this. Sometimes we eat a little too much here or there--->>Between my birthday and moving into a new house and Thanksgiving there was lots of celebration and too much splurging!!! It was time to get back on track and REALLY gear up to stay on track for this holiday season because you know how tricky that can be BUT I AM COMITTED!! This was the PERFECT solution to kick my healthy eating habits back in gear and help set me up for success this holiday season. This is NOT a juice cleanse. It is a healthy plant based cleanse FILLED with fiber, protein and fruits and veggies. So it isn't hard on your body and you are not starving yourself, rather ridding your body of toxins. I felt light on my feet and REFRESHED! I was down 3 lbs and 2.5 inches combined from waist and hips. This puts me in GREAT position to start my NEW program: INSANITY MAX: 30! 1. Want to start your fitness journey with a little JUMP start! This is what a day looks like on the 3 Day Refresh. I was never hungry. I wanted things other than I was allowed BUT I was never hungry. These cleanses always show how we are at self disciplined. I am not very good haha! BUT I did not cheat once and made it through and that makes me feel so proud! The Bad: I am not a big fan of vanilla so the Vanilla Fresh wasn't my favorite but it was manageable. I just prefer chocolate. The Ugly: Fiber Sweep was YUCK but I got down as much as I could, as quick as I could and DONE. Really the flavor wasn't bad at all. Just the consistency. 1. Cut, prep and plan everything ahead of time! 2. Plan to do it during a low key time. Maybe beginning or mid week. The weekend was not the best choice for me. 4. Take before and after pictures and measurements.